We had another successful wind turbine building course last week with Paul and Kevin from Cork, David from Wexford, Lee from Wicklow, Mícheál from Cavan and then we were joined on Wednesday and Thursday by Michael from Derry. 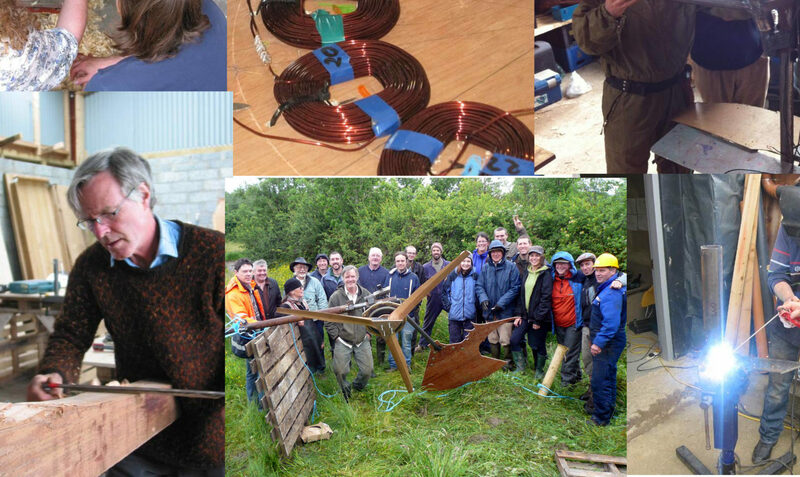 This workshop was a deviation from the norm where we would build a wind turbine from scratch. But this time our magnets did not arrive in time, reckon it was the ash cloud, so we had a 4.2m machine that needed finishing and decided to make a set of 2.4m blades. For the blades we glued up some 3×11/2” spruce with waterproof pva. This timber was 70mm thick and gave us a nice twist as can be seen in the photos. For the 4.2m turbine we wound a 48v stator, cast one of the magnet rotor disks and finished off the blades. Balancing the machine worked out well using our tripod, it’s nice to be able to work on a big turbine without waiting for a calm day. On the last day of the course the team visited our place and we took down the 3m machine for everyone to have a look. We usually offer the finished turbine to workshop participants for the price of the materials and we put the names of the interested people in a hat and draw out the lucky winner, this time it was Michael from Derry and David took the 2.4m blades.